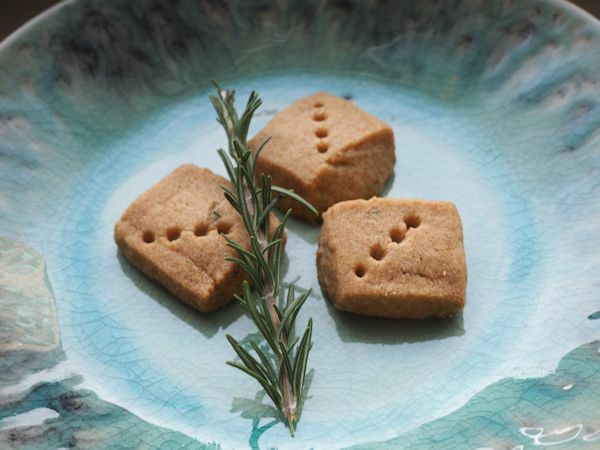 Glass of Fancy » Blog Archive » Rosemary Whole-Wheat Shortbread - Fashion, fiction, and life in the city. In a large bowl, mix first five ingredients by hand or in a stand mixer until a consistent dough is formed. Stir in rosemary and pat into a 9” by 13” pan. Score into 1” squares and prick each square with a fork. Chill one hour or until hard. Preheat oven to 300 degrees F. Break dough into squares along the scoremarks and bake 35 minutes or until cookies are golden. Remove and cool on a rack. Barbecued Spiced Pomegranate Rabbit at Foodnutzz. Shrimp and Pomelo Vegetable Salad at Asian in America. Turkey Spring Rolls at Spicebox Travels. Duck Confit at Monday Morning Cooking Club. Malay Ayam Masak Merah from Cheryl Lu-Lien Tam. Sausage Rolls and Piroshkis at The Cook’s Notebook. This entry was posted on Friday, December 12th, 2014 at 2:49 pm	and is filed under Manna. You can follow any responses to this entry through the RSS 2.0 feed. You can leave a response, or trackback from your own site. Annabelle I love the look of these – the whole wheat flour and the rosemary really add another dimension to shortbread. Yum! Sounds lovely! Rosemary is a true weed out here in California, and I still remember the shock I felt when I first moved here at seeing bushes of it all over the place.